Eire Og GAA Pavilion, Ovens warmed to a fascinating County ScÃ³r na bPaistÃ­ Finals where a capacity attendance enjoyed the pursuits of competing teams countywide in the GAA promoted feast of cultural entertainment. 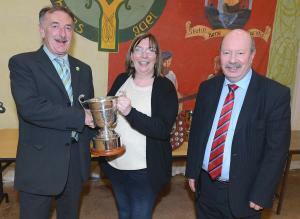 Boosted by a hat trick of wins, Boherbue collected the Best ScÃ³r na bPaistÃ­ club. And Boherbue emerged popular winners of the Padraig Ã CearÃºil Cup as Best ScÃ³r club in the county in a league competition based on participation and success at underage and adult level. In doing so, Boherbue were regained the title, club representative Margaret Kiely accepting the trophy from Co. CultÃºir Officer Gerry Walsh and Coiste ScÃ³r Cathaoirleach Tony McAulliffe. Seandunâs SeÃ¡n O Fathaigh compered the proceedings as Fear Aâ TÃ­. TrÃ¡th na gCeist: (1) Boherbue, (2) Newcestown. Boherbue's Margaret Kiely receives Corn Padraig Ã CearÃºil from Gerry Walsh, Co. Oifig CultÃºir in the presence of Tony McAulliffe, Cathaoirleach, Coiste ScÃ³r to mark their Best ScÃ³r club in Cork Award.